Dio Horia gallery is pleased to present the most recent work of Greek-Swiss artist Iliodora Margellos in a solo exhibition to be inaugurated at the gallery’s space in Mykonos on May 27, 2018. Margellos’s multidisciplinary work involves drawing, painting, sculpture, site-specific installations, embroidery as well as performance. Her work sits in between figurative and abstract art practices and focuses on the discovery and understanding of the human body in its interaction with nature. The exhibition is entitled One Sun For All and acts as a fragmented narrative of the human condition under the sun. The title is inspired by the Latin proverb ‘Sol Omnibus Lucet’ (Gaius Petronius Arbitrator, Satyricon 100): the sun shines on everyone and makes no distinction. It stresses the importance of equal rights for every human being to access common goods. 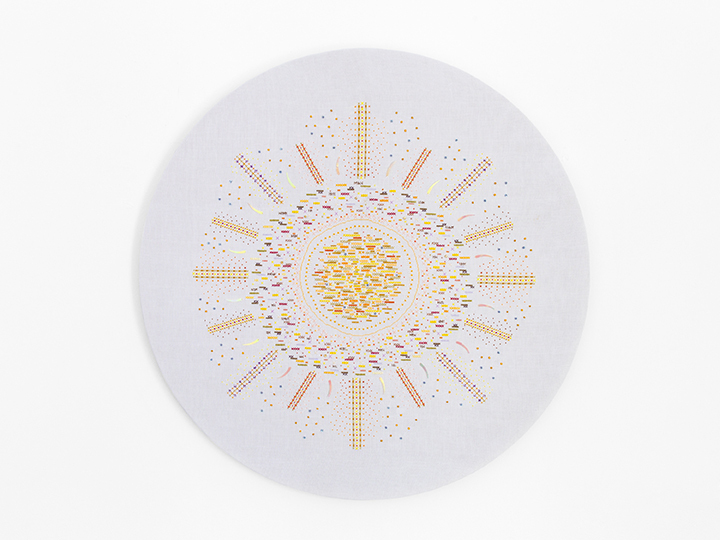 sun as an embroidery made of cross-stitched threads, beads, sequins and bone on cotton canvas. She installs ‘The Sun’ embroidery as a centerpiece of the gallery space and places on its opposite wall a composition of nine embroidered works on metal screens ‘Facing The Sun’. Thus the titles of the individual works in the installation ‘One Sun for All’ have both an interpretative and directional quality to them. The works entitled ‘Facing the Sun’ depict landscapes as they interact with each other and their environment by creating a ‘kosmos’. Initially, this ‘kosmos’ looks idyllic with its beautiful sunsets, flowers and glittering gems. However, if one takes a closer look, the works may depict a wounded universe pieced together in an attempt to dissimulate its dangers and injuries. Margellos designs fragmented snakes and grey clouds that stand as omens of this reality. However, she makes them look eerie so that they serve as a reminder and a warning addressed to their alert and active observer. All of these landscapes look like oil paintings on canvas but in fact they are woven with threads and beads sewn on metal screens. The use of the metal screen as the basis of her embroidery is a recent technique employed by the adding to her continuous interest in the coupling of domestic and industrial materials and soft and hard surfaces.